Giving away these twelve cookbook. They're a little worn, but that just means they were used often, a sure sign of a good cookbook. Contest now closed, announcing a winner shortly. What a wonderful group! I'd love to give them a home. I LOVE cookbooks. I'd love to win. Thanks for entering me. It's funny how it's impossible to have too many cookbooks! These look brilliant. Oh, I love old cookbooks! Hope i win. Well-worn is beautiful to me!! I would love to win these! Worn equals great recipes! I am a huge cookbook lover! Oh these are lovely. I would love a chance to look through them. Now you are talking my language! I adore old cookbooks! Wow, I cannot believe you have a copy of the New Delineator Recipes! What wonderful treasures! I love to add these to my collection - thank you very much. I love old cookbooks.. That Betty Crocker Cookbook is what i used to learn to cook in the first place. These books would be well loved at my house. My 13-year-old daughter is SUCH a cooking maniac! I would love to win these for her! Wow, treasures, all! I'd love to try out some of the recipes. Thanks for offering them. I'm sure my husband would hate having more books, but one can't have too many cookbooks, right? Esp if I use them! My 85 year old mom would LOVE these! I love old cookbooks! I have some from my grandma and a few from antique stores. Would love to have these in my collection! I love old cookbooks! I have some from my grandma and a few from antique stores. Would love to win this collection! Please enter me! Thanks very much. I'm not entering, as I've won something from you before (thanks! ), but I wanted to say that I own a copy of the Little House Cookbook, and it's fascinating. It gives modern directions on how to make nearly everything Wilder describes in the book: easy things like pancakes, and more unusual things like cheese. It also offers a good explanation of how cooking techniques and food themselves have changed over the last century or so. i know someone who would love these! I would like these books, please. These classic books would be a great present for my mom, she grew up with some of them and would share them with all of her grandchildren. OMG - you were reading my mind. I was just going to send you an e-mail asking you if you ever run across old and/or unusual cookbooks ... guess this answers my question! :-) Would LOVE these books as an addition to my collection! Thanks for the give away!! Old cookbooks are my favorite kind. Please include me in the drawing. I collect old cookbooks! Fingers crossed! Cookbooks with real history. How I'd love to try those recipes. this is my comment. love cookbooks. fingers crossed. looks like some peter pauper books in there. I too love old cookbooks! Oh! I have just the place for them! Oh how wonderful, I would really use them! I am a great delver into old cookbooks before 'self-rising flour' and other abominations became common to create my various dishes and cakes. My plain organic four dusted fingers are crossed. I'm sure these were well loved and well used. Wow!!! My passion is old cookbooks! I promise I'd give them a good home, and a good work out! Hope I win! Are you kidding? I learned how to cook from the Betty Crocker picture cookbook, I would love this collection. I collect old cookbooks myself. I love, love, love cookbooks. Sign me up. I used to have The Little House Cookbook but lost it in a move. It would be so nice to have a copy again. I give away cookbooks too. But if I won these, I'd keep them for myself! I would love to win! I've heard good thing about the Little House cookbook. 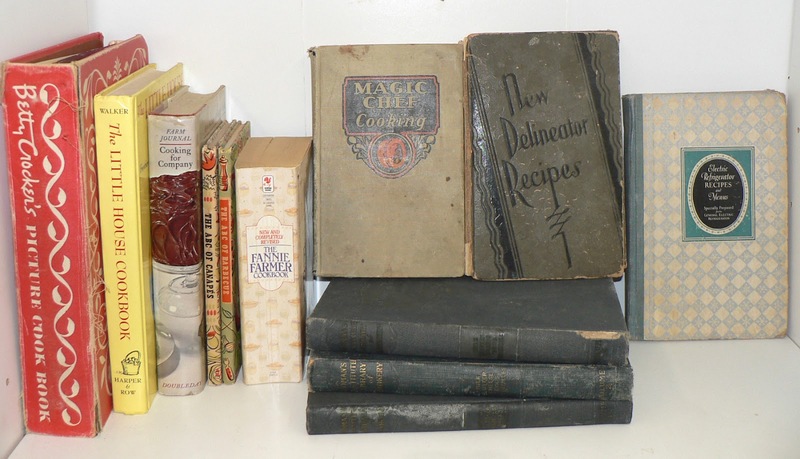 Old books + cooking = love. Please enter me! Nice collection! I'd love to add it to mine. They do look interesting! I love old recipes. They look interesting. I love old recipes. I love cookbooks with a history behind them. These would be well loved! Oh my, these giveaways just keep getting better and better! My husband teases that I collect cookbooks, so these would be right at home in my home. I'm trying to write my own cookbook. I'm sure these would inspire me! These look so neat! I'd love to see these recipes. Thanks for sharing! Me please! I have a friend who will adore these! Yes yes yes! Love trolling through old cookbooks. Add me to the giveaway please! I'd love to have these. I collect cookbooks. I LOVE cookbooks - especially old, tattered ones. It means they've been well-loved.